| Clear Expectations | Though the two may overlap, successful practices develop both protocols—step-by-step documentation of the facility's operational procedures—for all employees to follow, and job descriptions that outline each employee's speciﬁc tasks and duties. For example, a job description may tell a receptionist that one of her duties is to turn off the coffee pot at night. A protocol lists all of the steps that must be taken each night to close the practice, such as "People want to have some basic idea of what they will be doing before they even consider taking a job." logging out of computer systems, shutting down the lights and locking the doors. 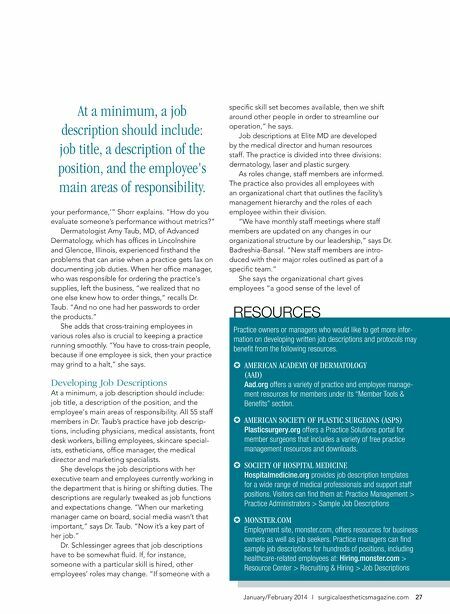 As mundane as they may seem, job descriptions and protocols are crucial to helping practices increase productivity, keep employees on task, reduce costly staff turnover, and ensure the safety of both employees and patients. Wendy Lewis, owner of The Knife Coach, a cosmetic surgery coaching service and former manager of plastic surgery practices, notes that job descriptions play another improtant role as well: improving patient retention. While patients 26 Surgical Aesthetics ❘ January/February 2014 Supporting Your Staff Once hired, staff members continue to beneﬁt from clear job descriptions and protocols, says dermatologist Sonia Badreshia-Bansal, MD, who operates Elite MD—a dual-specialty practice with more than 50 employees—with her husband, plastic surgeon Vivek Bansal, MD. "In a large medical practice, job descriptions enable staff to understand the speciﬁc duties and responsibilities of their positions," she says. "They can refer to their job descriptions to measure whether or not they are performing satisfactorily and meeting expectations." Jay Shorr, founder of The Best Medical Business Solutions (thebestmedicalbusinesssolutions.com), a consultancy that advises medical practices on business and management issues, says it's not fair for an employer to evaluate a staff member if she has not been told what is expected of her. "A job description tells the employee: 'These are the skill sets I'm asking you to maintain so I can evaluate © THINKSTOCK Written job descriptions help employees perform their duties more conﬁdently and can reduce costly staff turnover. may not know whether or not a practice has job descriptions and protocols in place, they certainly can sense when a practice is not well run. "Patients are very savvy," says Lewis. "They pick up on it when employees are annoyed or there is disruption. They notice when there's a different person at the front desk every time they visit, or when staff is not going out of their way to make them feel warm and fuzzy." Joel Schlessinger, MD, who operates a dermatology and cosmetic surgery practice with 85 employees in Omaha, Nebraska, says job protocols and descriptions inspire conﬁdence among employees and patients alike. "There's a level of assuredness that those job descriptions and protocols bring to a practice which is quite helpful," he says. "It makes working in a medical ofﬁce pleasant for everyone." One of the ﬁrst tasks he took on before launching his practice 20 years ago was to sit down at a computer and write job descriptions for each employee he would be hiring. He notes that this step was key to completing another early—and ongoing—task of running a successful practice: hiring topnotch employees. "People want to have some basic idea of what they will be doing before they even consider taking a job," says Dr. Schlessinger. "It puts their minds at ease."